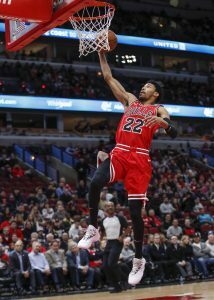 Otto Porter Jr. entered into a new chapter of his basketball career when he was dealt to the Bulls earlier this month. The 25-year-old small forward is happy with his new home, telling Hoops Rumors that he believes Chicago has a bright future. “We have a lot of young guys, young pieces. The team is definitely headed in the right direction, trying to get back to winning basketball here,” Porter told Hoops Rumors before last Friday’s game against the Magic. Porter, who grew up in Missouri, added that the transition to Chicago has been a smooth one. When he signed his four-year, $106MM with the Wizards during the summer of 2017, the small forward planned on living out his contract in the city where he attended college and made his NBA debut. “When I signed the deal [with the Wizards], I didn’t think I was going to get traded,” Porter explained to Hoops Rumors. Leading up to the trade deadline, management reportedly reiterated to Porter that they weren’t going to trade him away. The former No. 3 overall pick previously said he felt that the team lied to him. Wizards owner Ted Leonsis addressed the response, telling multi-media reporter Mike Wise (Twitter link) that understands Porter’s stance and he feels “terrible” about it. “We did tell him we weren’t going to trade him. We were going to keep our core together,” Leonsis said, before adding that the team was preparing to make another deal that kept Porter, Bradley Beal, and John Wall together on the team. “We actually had some other things that we were going to do, and another trade that would have kept the core together and given us flexibility,” Leonsis said, admitting that the hypothetical deal didn’t pan out. Porter developed into an ultra-efficient scorer over the past few years in Washington, someone who’s capable of excelling as a primary ball-handler or alongside other play-makers. The 2017/18 season was his apex with the Wizards, as he made 44.1% of his 4.1 attempts from behind the arc, a figure that was bested by just two players leaguewide. Porter finished the campaign eighth overall in turnover percentage and sixth among all wing players in effective field goal percentage. While his numbers dipped slightly to begin the 2018/19 campaign, peak Porter has arrived in Chicago. During his six games to date with his new club, Porter has a true shooting percentage of 65.4%, making over half of his 27 attempts behind the arc. His player efficiency rate over the first 191 minutes of his Bulls career is an electric 19.4. The Bulls are 4-2 with Porter in the starting lineup, though the wing left halfway through his sixth contest with the team after suffering a lower leg strain. Porter remains out with the ailment as of this writing. From an on-court perspective, Porter’s role with the Bulls isn’t expected to be dissimilar to the one he had in Washington. Off the court, he moves from a situation in which many of his teammates were his elders to one in which his NBA experience trumps that of many fellow Bulls. He’s embracing the change. Porter’s contract has two years left beyond this season, though his deal contains a player option on the final year, which comes in at approximately $28.5MM. He’ll get to see Chicago make one offseason of moves and play a season-and-a-half worth of games with his new club before making his decision on that option for 2020/21. Monetizing the legalization of sports betting is a hot topic among owners of North American professional sports franchises and several NBA teams are positioning themselves to be at the forefront of the movement. The Wizards and Kings are among the teams looking to educate potential bettors in preparation for when legalized betting arrives in their respective areas, as ESPN passes along. “I think this is the most important new business for us,” Wizards owner Ted Leonsis said while stressing the importance of making sure new bettors are not confused when placing wagers. The Kings are allowing fans to “Call the Shot,” something that gives fans the ability to predict outcomes like the score of a quarter or the statistics of a certain player. The team is adding a lounge for premium seat holders where fans can go to and use iPads to make “bets” before returning to their seats to watch the events unfold. The Kings are calling the experience “predictive gaming.” which is expected to be available for four select games in March. There currently is no monetary value to the “bets,” as fans can play for free and will get virtual credits for winning. Sports betting is not currently legal in California but the Kings will have the infrastructure in place should wagering become legal. Washington D.C. is closer to legalized sports betting than California, as a bill that would allow sports betting inside of professional sports franchise stadiums and arenas is expected to be passed before the end of the NBA season. The Wizards are among the franchises in the district that are expected to build a Las Vegas-style sportsbook inside its stadium, according to the Washington Post. Brick-and-mortar sportsbooks are expected to be permitted inside of Audi Field (D.C. United of the MLS), Capital One Arena (Wizards, NHL’s Capitals), St Elizabeth’s East Entertainment and Sports Arena (WNBA’s Mystics and Wizards’ G League affiliate GoGo), and National Park (Nationals of the MLB). The Wizards have been progressive about getting their fans familiar with real-time betting. The team scheduled live, alternate sports betting broadcast for seven games this season where potential bettors can view what a version of live betting will look like while they watch the Wizards play. Shifting experienced bettors away from the illegal market remains a challenge. CEO Geoff Freeman of the American Gaming Association believes it’s going to take a partnership between the leagues and betting operators to ensure that illegal bookmakers are put out of business, as I passed along previously in a piece for CNBC. Eight states (DE, MS, NJ, NM, NV, PA, RI, WV) currently allow for sports wagering, though the impact on the illegal market hasn’t been drastic. “It’s not as if the bookies are out today shopping for new careers,” Joe Asher, CEO of the Britain-based sports betting operator William Hill, said after the landmark Supreme Court decision which made sports betting a reality in many states. Pennsylvania is the only state with an NBA team that currently has legalized sports betting in place. However, there is no mobile betting available yet, so Philadelphians cannot place legal bets from inside the Wells Fargo Arena as they watch the Sixers play. The Wizards have been below .500 and on the outside of the Eastern playoff picture all season, leading to speculation that the team may shop highly-paid veterans like John Wall, Bradley Beal, and Otto Porter. Asked today during a Q&A with WTOP in Washington about that possibility, however, Wizards owner Ted Leonsis dismissed the idea of a huge pre-deadline deal. “We’re not trading any of those players,” Leonsis said of his Big Three, per Noah Frank of WTOP (Twitter link). It’s the second major declaration this month by Leonsis, who said two weeks ago that the Wizards will “never, ever tank.” It was clear at that point that Washington planned to hang onto Beal, who has been leading the charge to get the team back into playoff position. Recent reports have indicated that the Wizards may be more open to the idea of moving Porter, but Leonsis’ comments today seem to suggest that’s not in the cards this season. As for Wall, he’ll be sidelined for the rest of the 2018/19 campaign with a heel injury and is owed approximately $170MM over the next four years, so he has always been considered an unlikely trade candidate. Leonsis avoided directly addressing the future of general manager Ernie Grunfeld, but it seems safe to assume that he’ll re-evaluate the management group if the Wizards end up in the lottery. When asked if he was happy with Grunfeld, Leonsis replied that he’s happy if the club meets its goals (Twitter link via Frank). For now, the goal is a playoff spot. Jordan McRae‘s 54-point outburst in the G League probably won’t get him a standard NBA contract even though the Wizards have a roster spot to fill, writes Candace Buckner of The Washington Post. McRae signed a two-way deal with Washington in September, but has only appeared in eight NBA games with minimal playing time. With his Capital City team short-handed Friday, McRae took over the offense and poured in the most points in a G League game this season. McRae is averaging 29.5 PPG in the G League and set the league’s single-game record with 61 points in 2016. Still, the Wizards are more likely to add a player on a 10-day contract than convert McRae’s deal, a source tells Buckner. Washington has been at 13 players since waiving Ron Baker on January 7 and has until Monday to get back to the league minimum. Financial considerations are also working against McRae. Giving him a standard contract for the rest of the season would increase the Wizards’ projected luxury tax bill by about $1.2MM, Buckner estimates, much more than a series of players on 10-day deals. Bradley Beal will be one of the hottest names on the trade market if the Wizards decide to move him, and Ken Berger of Bleacher Report examines the best potential fits. A rival executive told Berger that the Raptors might be willing to offer Jonas Valanciunas, Delon Wright and a first-round pick, while the Celtics could part with Jaylen Brown, a first-rounder and either Marcus Morris or Aron Baynes and the Pacers might get involved with an offer of Darren Collison, Myles Turner and a first-rounder. Washington has denied that Beal is available, but the team’s future tax situation could affect the decision if the Wizards slip further out of the playoff race. A couple of recent comments by Wizards owner Ted Leonsis suggest he is running short on patience with the team’s 1-7 start, relays Chase Hughes of NBC Sports Washington. Leonsis, who attended Saturday’s debut game for the G League’s Capital City Go-Go, responded to a comment from NBA Commissioner Adam Silver about increased scoring around the league. “They just have to play us,” Leonsis said about teams wanting to score more points. Leonsis issued a “no-excuses” ultimatum to the organization before the start of the season, making it clear that he expected a title contender. Hughes notes that Leonsis has a right to want a return on his investment after giving the team a $133MM payroll, a highly paid head coach and a newly built, state-of-the-art practice facility. Hughes offers several suggestions for coach Scott Brooks to shake things up in a separate story. His ideas include changing the starting lineup, giving more minutes to Tomas Satoransky or rookie Troy Brown and offering Jason Smith or Thomas Bryant a chance to crack the rotation. It’s been a nice year for Wizards‘ owner Ted Leonsis, reports Chase Hughes of NBC Sports Washington. The 61-year-old billionaire saw his Capitals win the Stanley Cup in June and the Wizards opened a new practice facility, the St. Elizabeth East Entertainment and Sports Arena, just last week. So perhaps you can’t blame him when he says that there are “no excuses” for the Wizards anymore and that it’s time for the team to accomplish their goals. Leonsis feels that he’s done his part, giving the team the necessary resources to succeed. He also cited the Capitals recent success as proof the Wizards can reach their goals. The AP initially reported that newly-acquired Wizards’ center Dwight Howard may miss the start of training camp with a sore back, and pursuant to a tweet from the team itself, it appears as though Howard did indeed miss the first day of practice, with head coach Scott Brooks telling reporters the veteran center is day-to-day. In another article for NBC Sports Washington, Hughes talks about how the Wizards are set to begin the 2018/19 season with seven players on expiring contracts, yet still believe that the added dynamic will not affect the success of the club, with players understanding that winning will raise each individual player’s value more than individual statistics could. As we relayed last week, the Wizards signed both forward Lavoy Allen and guard Chasson Randle to training camp deals before beginning training camp this week. At $5.337MM, Dwight Howard was too much of a bargain to pass up, Wizards owner Ted Leonsis tells Chase Hughes of NBC Sports Washington. That’s the figure Washington was able to sign Howard for after he was traded to the Nets this summer and agreed to a buyout. This marks the third straight offseason that Howard has changed teams, but Leonsis calls his perceived bad reputation a “media-generated issue.” Howard remains productive and durable at age 32, averaging 16.6 points and 12.5 rebounds in 81 games with the Hornets last season. Howard is responding to critics who contend his low-post style doesn’t fit in the modern NBA, Hughes notes in another story. Howard has posted Instagram videos of his offseason workout showing him shooting 3-pointers and jump shots off the dribble from the foul line.